Quercus bicolor.Bobby Hattaway.discoverlife.org. (Accessed 9/2014). Quercus bicolor is a tree to 30 m tall; 80 cm dbh; to 300 years; bark gray, flaky, becoming deeply fissured and flat-ridged in older trees; white oak group (subgenus Lepidobalanus), roots associated with ectomycorrhizal fungi (Decker and Boerner 1997). Leaves alternate, widest well above middle, with 4-6 pairs broadly rounded (sometimes pointed but not bristle-tipped) teeth, fewer, deeper and less regular than Q. prinus, dark green above, wooly white below, base wedge-shaped. Flowers monoecious, green, male catkins, female flowers 1-few, May, wind pollinated. 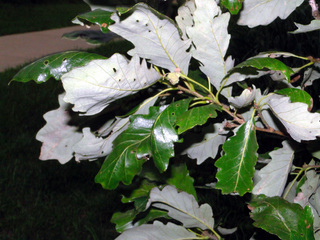 Quercus bicolor.fruit.Steve Hurst, hosted by the USDA-NRCS PLANTS Database. (Accessed 9/2014). 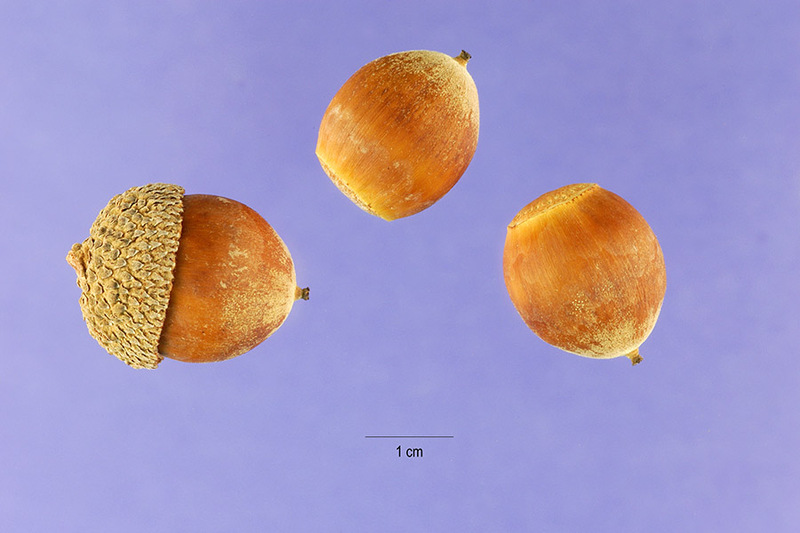 Fruit acorns about 2 cm, cap covers 1/2 the nut, tannin content low, matures same autumn, Oct-Nov., stalks to 7 cm (the only other white oak group tree with long-stalked acorns is Q. robur). Seeds dispersed by squirrels, blue jays (Johnson and Adkisson 1985) and other animals that bury acorns. Seeds germinate same autumn, sending down a root, sprouts the next spring. Acorns eaten by many birds and mammals that do not bury nuts (raccoon, foxes). Deer and rabbits eat seedlings and twigs, other animals eat buds. Habitat: Maturing or older swamp forests, edges of swamp forest and Phragmites marsh. Moderately shade tolerant. Intolerant of salt (Sinclair et al. 1987). Soil pH 4.3-7.5 (USDA, NRCS 2010). Quercus bicolor (swamp white oak).David Burg.Central Park, NYC.5.2016m(Accessed 5/2016). Notes: Foliage eaten by Gypsy moth larvae (Lymantria dispar), orangestriped oakworm (Anisota senatoria) other insects. 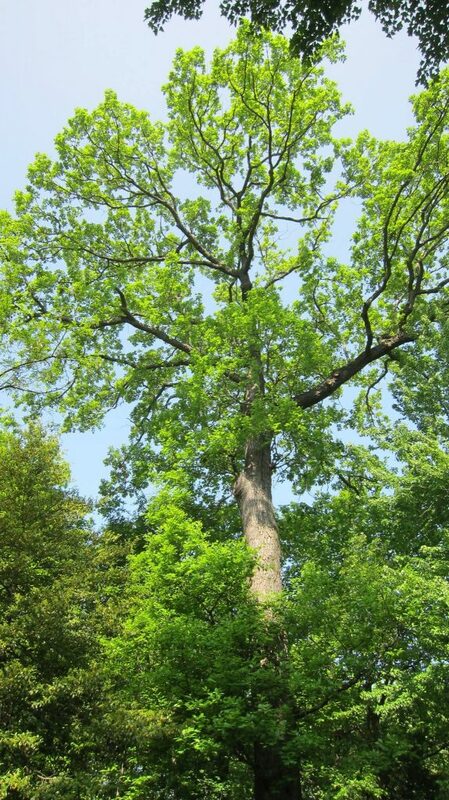 Trees occasionally killed by outbreaks of oak anthracnose (Apiognomonia quercina and/or Discula quercina) Trees weakened by defoliation, may be killed by a combined attack of the two lined chestnut borer (Agrilus bilineatus) and a shoestring fungus. Curculio weevils attack acorns. Oak leaf and twig galls are caused mostly by Cynipid wasps but also by some flies (Johnson and Lyon 1991). (See Q. alba for other insect predators).